Hi all! Even if it's been a while since I enjoyed PoE, this time around I wanted to share a cool group build for my favorite class: Paladin! 2) talking about paladins, it can seems counter interactive, but the best way to go after dragons and most of the endgame bosses is actually dumping your int. There are multiple considerations to do so but, let's be honest, the big reason is Drawn in Spring. Paladin are actually between the best DPS in game against a single big boy, thx to the NEVER ending duration of sworm enemy, dump int and Drawn in Spring. "Wounding" has fixed damage no matter your INT and stack with itself with consecutive attacks so, the worst your int, the fatest your full damage will be applied, making a Drawn inSspring low int character the highest damage dealer in the game. Couple this with the highest saves rolls of the game and 3x use of second wind (how I like to see at holy hands with a 3 int Paladin) per fight and you have a clear winner against the bad boys and, perhaps, the very best class in the game. 3) I tend to be a min/maxer at heart so, even if this build is focused around group play, its still pretty close in concept to a pure min maxed solo paladin. This run was done with fixed NPC (eder, aloth, durance) To create a custom save for Dreadfire. I had very mixed feeling about PoE sequel for a long time, but now I have finally chosen to buy it so I wanted a more intensive RolePlay run in Trial of Iron. So, enter HolyMoo, the stupidest Paladin around! 1) Race: Island Aumaua: in solo wild orlan is a much better race to tank dragons (and, honestly, one of the only 3 good races for solo min/max play along wood elf and moon godlike) but, in a group, I could give up some tankiness to unlock my 2 arquaebus slots and spend my precious talents on a much more Burst oriented path. 2) Paladin Order: Goldpact. To me goldpacts and bleackwalkers are no matter what the go to paladin orders, since they are the only 2 orders that dont have cruel has a disposition, wich unlock gift from the machine/effigy resentment for free. The amazing thing of Goldpact knights is that the unique talent enduring flames is ALSO a fixed damage DoT (hi, drawn in spring sinergies). Plus 50% fire damage DoT on flames of devotion is AMAZING burst at 3 int, and meh on an high Int paladin. 3) Paladins are the best boss tank in the game, given the insane fortitude/reflex Achievable. 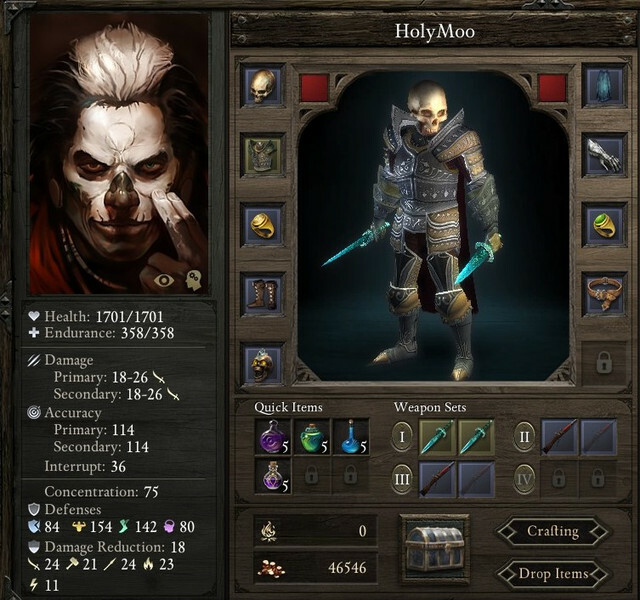 In a party, the HolyMoo is able to trade deflection and overhall better saves (dual wield over weapon and shield with little savior) for a much better and sinergic burst DPS, compensating with Eder for the Tank Deflection role and Durance for extra Defensive buffs. Quick slots: Potion of Eldritch Aim, Potion of Bulwark Against the Elements Potion of DaoM, Potion of Major Endurance. Chapter 1: Any dual weapon with accuracy bonus, Arbalests (plus 1Arquebus from Kana), Blunting Belt, Plate armor, Torc of Falcon Eyes, boots of stability and Gauntlets of Accuracy (!). Honestly, I had a blast playing the HolyMoo and she is now my favorite Party oriented Paladin I have never played. The basic strat against most encounters was to scout ahead in stealth, open with the 2 powerful Arquaebus attacks and then move in positon as fast as possible with the help of boots of speed. When fighting the big, bad, guys he was still able to tank them while abusing the evergreen combination of Drawn in Spring, low int and Sworm Enemy, rending any other damage from the party more or less an useless overkill! Of Course! With a potion of Daom, this build achieve zero recovery. You can also do so by skipping Two weapons Style and adding Gauntlets of Swift Action in the mix but, As I said, I consider Gauntlets of Accuracy Best in Slot for Paladins. Why He Carries Many Scars over, let's say, Ryona's Breastplate? I do consider He Carries Many Scars one of the best armor in the games, and the best one for low INT tanks. With low Int you dont have access to Constant Recovery, so the affix of this armor sinergies really well with the build (plus is a plate armor, has Defiant on top of that and you can achieve 0 recovery on top of it). For Act 2 buy Trollhide Belt ASAP as a momentary Replacement. Why Lilith Shawl over more powerfull options? I know, in a non solo run you can use the Cloack of Confort (one of the top 3 imba items of the game if you ask me) but I enjoy the old Lilith, especially on a build with high Stealth. Now, go and roleplay your super greedy Goldpact Paladin in his quest to achieve the biggest arquebus collection ever! Oh, and last note about arquebus, prioritize a set of them with Kith slaying ASAP for act 2, then slowly work into a pair with the right Slaying enchant for every creature in Eora! Edited by B4nJ0, 10 March 2019 - 02:21 AM. Edited by Boeroer, 10 March 2019 - 12:31 PM.